View More In Pregnancy & Maternity. The DNA Direct Home Paternity Test INCLUDES ALL LAB FEES for testing an alleged father and child. 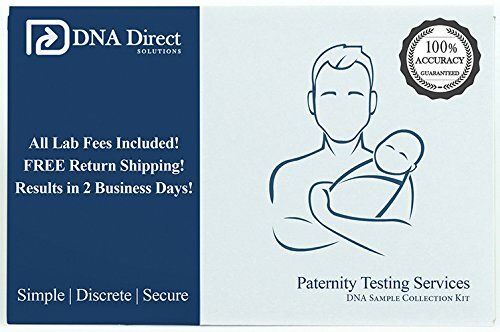 The DNA Direct Home Paternity kit is delivered to your door and includes cheek swabs, instructions, and a Free Return Mailer to the laboratory. Testing is 100% accurate. Discounts available if additional legally binding paternity testing is required. The accredited DNA testing laboratory is based in the USA. Paternity testing takes as little as 2 business days. Register online to receive your results. If you have questions about your paternity test results, a phone number and email are included in your kit. You will be able to print a copy of the paternity test results as soon as they are emailed to you. Due to New York State Law, this at-home DNA collection kit cannot be mailed to New York addresses. All Lab Fees Included for 1 Father and 1 Child. Testing Performed by an AABB & ISO 17025 Accredited Laboratory. Kit includes FREE Return Shipping back to the Laboratory. Register your kit online to receive your results. Professional and Confidential. Ships in discreet packaging for privacy. Phone Number Available for Questions. Kit includes PAIN-FREE cheek swabs for sample collection in the comfort and privacy of your home. DNA Direct cannot send at-home DNA collection kits to New York addresses. New York State Law requires that residents either obtain a court order or include a physician in the testing process in order to complete a paternity test. If you have any questions about this product by DNA Direct Solutions, contact us by completing and submitting the form below. If you are looking for a specif part number, please include it with your message.